The post-WW 2 world from 1945-1960 was characterised by a process of 'de-colonisation' in Asia and Africa. Widespread insurrection and violent revolution resulted in some former colonies. Communist Soviet Union and China were behind many of these revolutionary groups with the aim of installing like-minded governments in power to broaden their sphere of influence. However, some countries managed a transition to democratic self-rule even in the face of a communist insurrection. One of these conflict stands out as a very effective counter-insurgency that ultimately spawned two very successful democratic States; Malaysia and Singapore. The Malayan "Emergency" began in 1948 near Ipoh on the West coast of the Malay Peninsula, with the killing of a British plantation manager by communist insurgents. 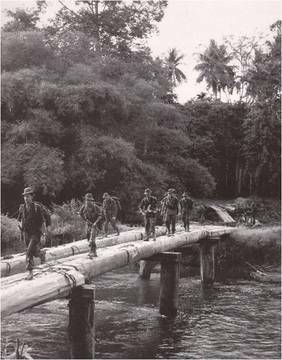 However, rather than succeeeding in their plan to create a communist State, the British conduct of the Malayan Emergency foiled communist ambitions and became one of the most successful counter-insurgency wars in history culminating in the creation of Malaysia as a democratic State in September 1963. Singapore formed as a separate but democratic country at about the same time. Australia's initial commitment did not take place until 1950 when 38th Squadron RAAF deployed. Then 38th Squadron was a composite transport/bomber squadron equipped with C-47 Dakota transports and GAF Lincoln heavy bombers, derivatives of the famous wartime Lancaster bombers. The bombers staged out of airbases at Tengah in Singapore and Butterworth on the West coast of the Malayan Peninsula to conduct bombing of Communist Terrorist (CT) jungle hideouts. Australia's ground troops were initially fully committed to the Korean War, but in 1955, the 2nd Battalion The Royal Australian Regiment (2RAR) was committed as part of the Commonwealth Far East Strategic Reserve.